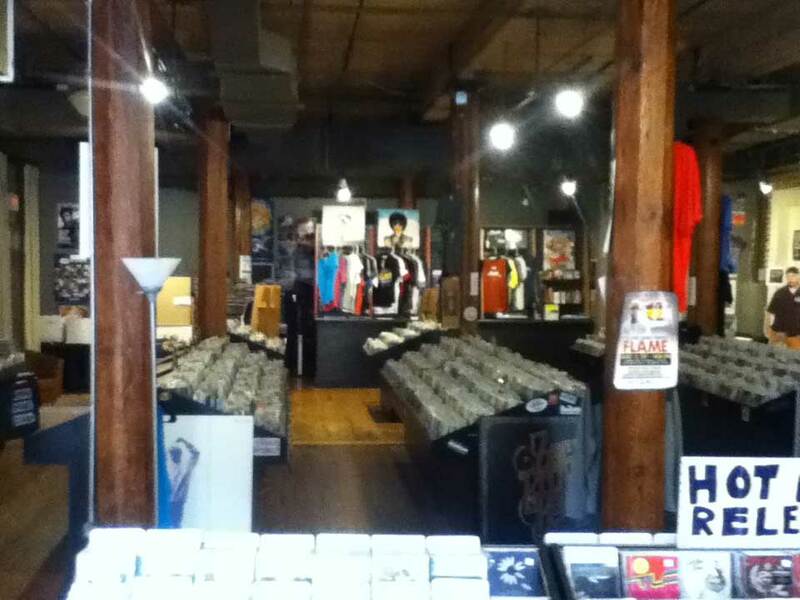 A record store… next to an investment broker??!! This is all wrong!!! I’d only previously shopped in Durham, NC once before, when we stopped in Bull City Records a few years ago and I found a Hot Chocolate album we wanted to hear. My wife was attending a processional conference in the Research Triangle last weekend, and I was on my own for several hours. I enjoyed the pool at the hotel where we were staying to the utmost of my ability, then checked out and took off for the Durham location of the famous regional Schoolkids chain. There used to be as many as seven of the shops in carious college towns in the Southeast back before The Great Record Store Culling of the Napster Era. I had visited the Gainesville, Florida store [note: Wikipedia says it’s not connected with the management team that owned these stores] in the early 90s on my first trip to that city to see Man…Or Astroman. I had also visited the Chapel Hill location in the mid-noughties onward when visiting friends who had moved to the area. There were a few things bought there, certainly. Currently, there are only three of them with one in Raleigh as well. I made my way to the location easily enough. The heart of the former tobacco trade at the heart of the state was now gentrified and repurposed into a shopping complex called Brightleaf Square. A huge, old red brick compound refitted as a series of tony boutiques. I quickly found Schoolkids after miraculously securing a parking space. On the trip over, I felt that surely the store would be stocking the recent DLX RM, four disc set of “Purple Rain,” and at the least, this would be accompanying me home. As I entered the store, the clerk, performing what seemed like populating their presumed Discogs store with stock didn’t so much as grunt in my direction. Typical. Non-plussed, I saw the new rack of CDs right upon entering the store. Not too many of them, really. I glimpsed the familiar cover of “Purple Rain” but it did not have the metallic foil cover I was looking for. It was merely the 2xCD extended version. Disappointing. I next turned my attention to a bin of new arrival used vinyl. I quickly saw something that I had heard about for 30+ years but had never actually seen; “The Great Lost Stranglers Album.” It was a Japanese only compilation of Stranglers non-LP B-sides in a cover that reminded me of the cover of the Lips Inc. album. No obi, and the stickers on the PVC bag rightly noted “Super Rare!! !” It could be mine for $19.99. Not tempting at that price and without the obi. Besides, I had all of the material on CD. The track listing was similar to the EMI “Rarities” B-side collection of the early 90s that had long since been in the Record Cell. Still, this was not a record I had encountered in the wild before. The false positive effect it engendered was my undoing. It motivated me to spend over an hour looking through the stock in this store when there was actually no reason to do so. There was a bin of new LPs that, as usual, I ignored. Instead, I pawed through the used vinyl, where anything that would catch my eye would be hidden. It became very apparent that this was some really tired record stock that had been around the block several times on its march through history from the mid-70s through to today. Take another look at that Strangler’s pic above. Do you see the Argent artist tab? Who, under the age of 50 today, even recognizes the name of Rod Argent??! Or more importantly, cares? I had looked at the used vinyl and had seen nothing. I next look at the trashed vinyl [<$2.00] and that was even worse. The usual records that proliferate in thrift stores abounded, and in similar condition. It turns out that the people who took the worst care of records ever, were basically my grandparents! Having rifled through the vinyl to no avail,I next turned my attention to the used CDs. I have to say that one of my beefs with record stores today are the vast amounts of floorspace given to new modern vinyl at the expense of used vinyl and CDs. This store stood that common paradigm on its edge. There was a modest amount of new vinyl here, and some new CDs as well, but the vast majority of floor space here was being used for used vinyl and used CDs. It would have been the best of all possible worlds, had they only had something that I would have bought! But that was not the case. I searched through the CD bins only to find a single CD that was of interest. In fact, it was even on the almighty want list. I managed to have bought all of the fine EMI compilations of Cabaret Voltaire collections that were released from 1998-2002… except one. “Remixed” has escaped my grasp and yet, here is was. At the front of a bin, no less, so I immediately noticed it when walking nearby. I took the photo at right and when I turned it over, I saw a $16.99 used price on that bad boy! No way. I was mainly buying this for the incredible “Don’t Argue [Live Jacknife Drum Remix]” finally on CD! It’s an Adrian Sherwood mix I have on the 12″ single but this was the only shiny CD with the Blue Velvety styled mix with acoustic drums by Chakk’s Diarmuid Boyle. 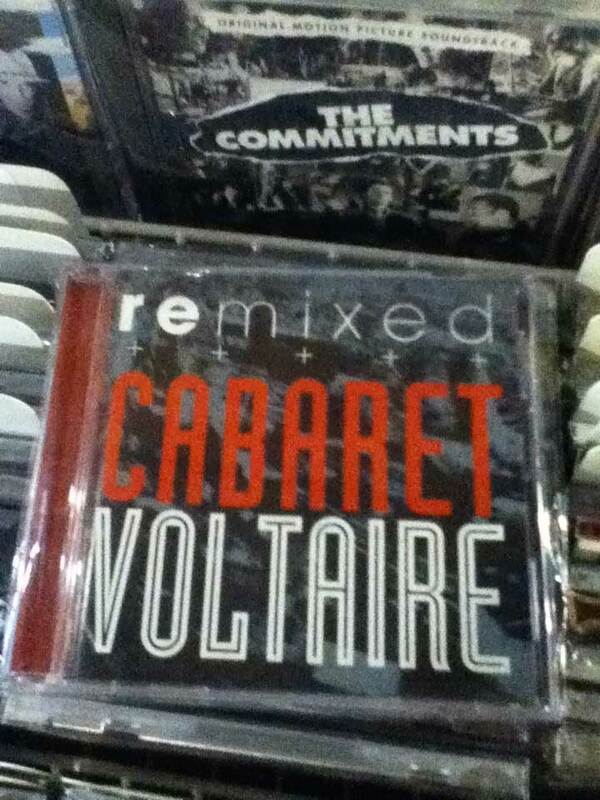 I love this mix, but not enough to pay twice the going rate for a copy on CD! I continued on my deathmarch to give the tired stock in this place a glance. Only because I should not show up to meet my wife too long before her seminar was over. This was one of the most perfunctory record store visits I’d ever had. What was worse, the store was also dimly lit; another of my Record Store Bête Noirs! More than anything, I was curious about how this place came to be. I thought that the End Times [Napster era] had killed off any lame record stores but this one proved my theory was wrong. The freaky thing was that this store in all other ways but stock and pricing, hit all of my buttons. It was mostly CDs and used vinyl. Normally, cause for celebration. I should hasten to mention that it was occupying space in the upscale Brightleaf Square shopping district. It could not have come cheaply, yet the evidence here suggested that there were not too many sales. One other older guy stopped in while I was there and he didn’t waste as much time as I did. He also left empty handed. This store in the Schoolkids chain suggested a take on the 60s aphorism: what if they gave a record store and nobody shopped? This entry was posted in Record Shopping Road Trip and tagged 2017. Bookmark the permalink. Too bad you didn’t find anything. I do enjoy reading about your record store trips. 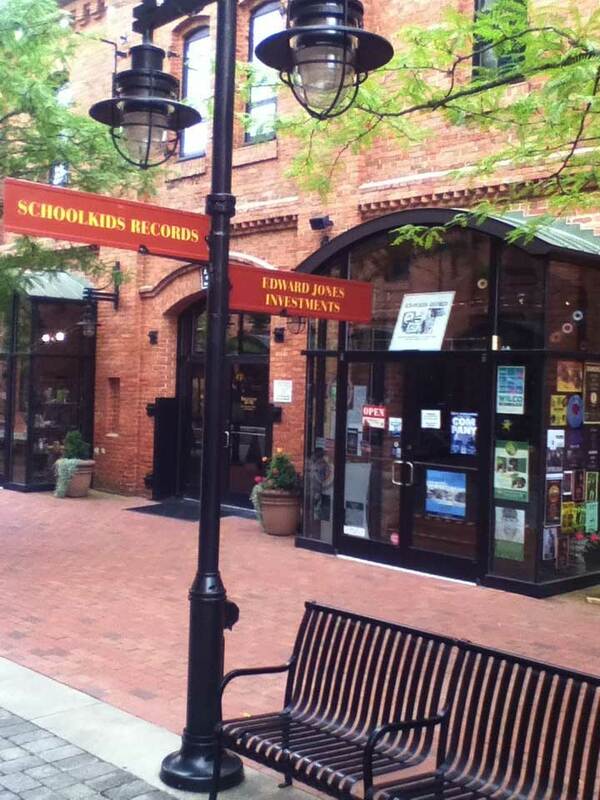 I’m blessed w/having two good places in my area, the Record Exchange in Salem, MA (been going there for nearly 40 yrs) & Mystery Train in Gloucester, MA. I also like the fact that you don’t hold the CD format in disdain. Most of my collection are still in CDs & I’m very happy w/the format. I think it’s very funny to see these vinyl reissues coming out @ these exorbitant prices & that CDs are actually cheaper these days. diskojoe – Well, I can’t find stuff to buy every time out, I guess. This store was a weird one. I don’t see how they remain viable on the face of things. On the other hand, I’m impressed you’ve been shopping at the same store for 40 years!! Rare is the store that can last that long! “Don’t hold the CD format in disdain?” Buckaroo, I hold vinyl in disdain!! It’s a problematic, inferior, self-degrading sound carrier format that I cannot believe is making a comeback of sorts! What next… shellac??!! I could not wait to leave vinyl behind 30 years ago! I was anticipating the CD ever since reading about the early prototypes in Popular Science around ’79-’80. Digital data in a durable hunk of polycarbonate! What’s not to love? And the economic factor you mention is substantial! I’d starve if I had to buy everything on $20-50 LPs pressed in cobbled together on equipment using little more than slave labor and recycled PVC in the former Soviet Union! And these records often sound like 180g dreck! 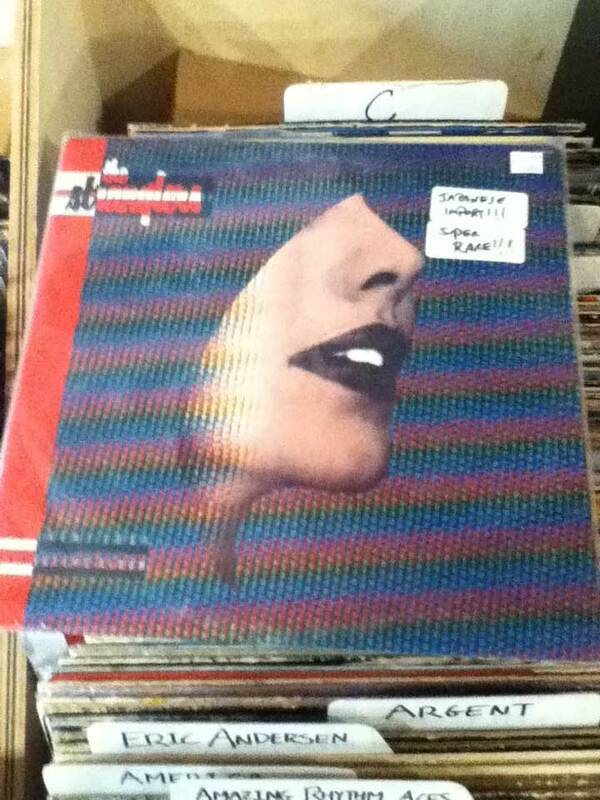 A+M virgin vinyl pressings from the mid-80s blow this new stuff away! The quality on neovinyl is so widely variable it’s a real minefield. I still have the very 1st record that I bought @ The Record Exchange, a copy of The Rolling Stones’ December’s Children. I think that one of the reasons that it’s still hanging on is that it’s taking advantage of the vinyl revival, although they still have plenty of CD’s. As for the quality of vinyl, I remember that records were very crappy in the 70s & 80s w/the oil shortages of that era. I remember returning a copy of Paul McCartney’s Tug of War that I bought as a gift for a friend 3 times because the quality was crap. I hate to think that the quality of the new vinyl stuff is the same. I love the thought of shopping at the same store for most of your life, no chance of that here in the UK, unless you live in Cardiff where they have the oldest record store in the world…Spillers! Here in Bristol there used to be 6 stores more in less in one street, now down to 2 soon to be 1. SimonH – That notion seems alien to me. I’m used to record stores having a very finite life cycle in the Southeast United States where I live. Zero of the best stores where I shopped in Orlando growing up still exist. By the time I moved away they were all memories. Only the zombie record store Retro Records is still there. They were the first used record store I ever went to, and a revelation in 1981, but that was under the aegis of original owner Bob Ponder, who had a New Wave section that made it super easy to shop there! Bob sold the store off in the late 80s to the people who own it now. Stopping in annually would reveal no change in the store what so ever. Who knows how they still stay open.